NCERT Solutions for Class 10 Social science Chapter 2 Sectors Of The Indian Economy are provided here with simple step-by-step explanations. These solutions for Sectors Of The Indian Economy are extremely popular among class 10 students for Social science Sectors Of The Indian Economy Solutions come handy for quickly completing your homework and preparing for exams. All questions and answers from the NCERT Book of class 10 Social science Chapter 2 are provided here for you for free. You will also love the ad-free experience on Meritnation’s NCERT Solutions. All NCERT Solutions for class 10 Social science are prepared by experts and are 100% accurate. (i) Employment in the service sector has not increased to the same extent as production. (ii) Workers in the tertiary sector do not produce goods. (iii) Most of the workers in the organised sector enjoy job security. (iv) A large proportion of labourers in India are working in the unorganised sector. (v) Cotton is a natural product and cloth is a manufactured product. (vi) The activities in primary, secondary and tertiary sectors are interdependent . (b) Production of a commodity, mostly through the natural process, is an activity in ______________ sector. (c) GDP is the total value of _____________ produced during a particular year. Find the odd one out and say why. He is appointed by the government, while dhobi, tailor and potter belong to the private sector. His is the only profession that does not require a formal education. The rest are workers in the public sector, while his profession is part of the private sector. It is a private enterprise, while the rest are government undertakings. A research scholar looked at the working people in the city of Surat and found the following. The percentage of workers in the unorganised sector in this city is 70%. Do you think the classification of economic activities into primary, secondary and tertiary is useful? Explain how. The classification of economic activities into primary, secondary and tertiary is useful on account of the information it provides on how and where the people of a country are employed. Also, this helps in ascertaining as to which sector of economic activity contributes more or less to the country’s GDP and per capita income. If the tertiary sector is developing much faster than the primary sector, then it implies that agriculture is depleting, and the government must take measures to rectify this. The knowledge that the agricultural profession is becoming unpopular or regressive can only come if we know which sector it belongs to. Hence, it is necessary to classify economic activities into these three basic sectors for smooth economic administration and development. For each of the sectors that we came across in this chapter why should one focus on employment and GDP? Could there be other issues which should be examined? Discuss. For each of the sectors that we came across in this chapter, one should focus on employment and GDP because these determine the size of a country’s economy. A focus on employment and GDP helps determine two important things—per capita income and productivity. Hence, in each of the three sectors, employment rate and status as well as its contribution to the GDP help us understand how that particular sector is functioning and what needs to be done to initiate further growth in it. Make a long list of all kinds of work that you find adults around you doing for a living. In what way can you classify them? Explain your choice. How is the tertiary sector different from other sectors? Illustrate with a few examples. The tertiary sector is different from the other sectors because it does not manufacture or produce anything. For this reason, it is also known as the service sector. It aids the primary and secondary sectors in development. The tertiary sector involves services like transport, storage of goods, communications, banking and administrative work. What do you understand by disguised unemployment? Explain with an example each from the urban and rural areas. Disguised unemployment is a form of underemployment where one has a job but the work is divided. It is not apparent as compared to someone without a job who is clearly unemployed. In rural areas, this can be seen in the farming community where all members of a family might be working on a farm even though so many hands are not required. They do so because of lack of another job. In urban areas, disguised unemployment can be seen in the service sector where painters, plumbers, repair persons and those doing odd jobs have work but they may not find daily or regular employment. Distinguish between open unemployment and disguised unemployment. Open unemployment is when a person has no job in hand and does not earn anything at all. Disguised unemployment, on the other hand, is mostly found in the unorganised sector where either work is not consistently available or too many people are employed for some work that does not require so many hands. This is the essential difference between open unemployment and disguised unemployment. “Tertiary sector is not playing any significant role in the development of Indian economy.” Do you agree? Give reasons in support of your answer. “Tertiary sector is not playing any significant role in the development of the Indian economy”. This statement is not true. 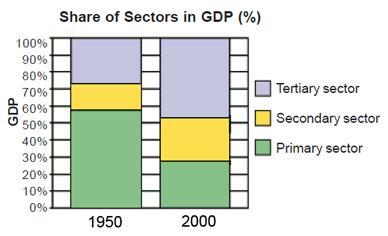 The tertiary sector has contributed vastly to the Indian economy, especially in the last two decades. In the last decade, the field of information technology has grown, and consequently, the GDP share of the tertiary sector has grown from around 40% in 1973 to more than 50% in 2003. Service sector in India employs two different kinds of people. Who are these? Service sector in India employs two different kinds of people. These are primary and ancillary workers. Primary workers include those who directly provide services while ancillary workers are composed of those who give services to the service providers. For example, consultants make available their services to consultancy firms etc. Workers are exploited in the unorganised sector. Do you agree with this view? Give reasons in support of your answer. Workers are exploited in the unorganised sector. I agree with this view. The unorganised sector does not offer any job security. Neither does it allow for scope of trade or workers’ unions. Workers can be easily exploited in this scenario. They cannot afford to rebel against an employer’s tyranny as the latter can fire them at any time. How are the activities in the economy classified on the basis of employment conditions? On the basis of employment conditions, activities in the economy are classified as organised and unorganised. The organised sector offers job security and employment benefits, while the unorganised sector is marked by low wages and lack of job security. In rural areas, the unorganised sector comprises landless agricultural labourers, sharecroppers and artisans. In urban areas, this group contains small-scale industry workers, construction workers, street vendors, rag-pickers, etc. Compare the employment conditions prevailing in the organised and unorganised sectors. The employment conditions prevailing in the organised and unorganised sectors are vastly different. The organised sector has companies registered with the government and hence, it offers job security, paid holidays, pensions, health and other benefits, fixed working hours and extra pay for overtime work. On the other hand, the unorganised sector is a host of opposites. There is no job security, no paid holidays or pensions on retirement, no benefits of provident fund or health insurance, unfixed working hours and no guarantee of safe work environment. Explain the objective of implementing the NREGA 2005. The objective of implementing the NREGA 2005 was to provide 100 days of guaranteed employment to those people in rural India who can work, and are in need of work. This Right to Work has been implemented in 200 districts. If the government is unable to provide this employment, then it has to give unemployment allowances to the people. Using examples from your area compare and contrast the activities and functions of private and public sectors. Discuss and fill the following table giving one example each from your area. Give a few examples of public sector activities and explain why the government has taken them up. A few examples of public sector activities are provision of water, electricity and some modes of transport. The government has taken these up because water and power are needed by everyone. If the work of providing electricity and water is left to private enterprises, the latter might exploit this opportunity and sell these at rates which the masses cannot afford. Hence, to ensure that basic amenities like water and power are available for all, the government supplies these at low and affordable rates. Explain how public sector contributes to the economic development of a nation. The public sector contributes to the economic development of a nation by not mere financial profits. The public sector plays a vital role in contributing to the Human Development Index via its functioning in health and education services. Also, by buying food grains at a “fair price” from farmers, providing electricity, water, postal services at low rates, the government ensures that the people have a good living. It utilises taxes and grants to pay for the same. Thus, it plays a vital role in adding to the economic development of a nation, based on its human development situation. The workers in the unorganised sector need protection on the following issues: wages, safety and health. Explain with examples. The workers in the unorganised sector need protection on the following issues: wages, safety and health. In the construction sector, labourers are employed on a daily basis. Hence, they have no job security. Here, wages too differ from time to time. Consequently, the government has set up a minimum wages act to protect such workers from economic exploitation. The same problem exists for miners working in private mining companies. Their safety is secondary to the company’s profits, and as a result, many miners suffer grievous injuries (and many a times, even die) due to inadequate safety gear and norms. Governments of most nations have now laid down strict rules for private enterprises to ensure workers’ safety. Most companies in the unorganised sector do not provide health insurance to their employees. Some of these might be involved in dangerous factory production that may harm a worker’s health in the long term. These workers need to be protected against the tyranny of the employer, and it is here that the government steps in. A study in Ahmedabad found that out of 15,00,000 workers in the city, 11,00,000 worked in the unorganised sector. The total income of the city in this year (1997-1998) was Rs 60,000 million. Out of this Rs 32,000 million was generated in the organised sector. Present this data as a table. What kind of ways should be thought of for generating more employment in the city? Ways to generate more employment in the city of Ahmedabad have to be provided by the government, especially in the unorganised sector. As the table shows, the organised sector’s earnings are much higher than that of the unorganised sector even though the latter employs almost 80% of the city workers. More companies need to be brought under the roof of the organised sector so that workers from the unorganised sector are attracted to jobs there, with higher and more secure wages. For this, the government must provide loans and aid to companies transferring from unorganised to organised sectors.